A bit lighter stuff yesterday even though fairly widespread but more on the way this arfternoon with another strong front approaching the south west . 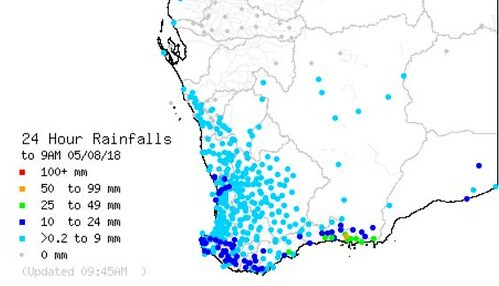 Good rain yesterday lots of big falls too over 50mms . Avon river will be raging for the descent this weekend . Los of areas went below 5 deg last night with that cold air coming up from the south. for the period until midnight WST Monday 6 August 2018. Bom warnings out for today. 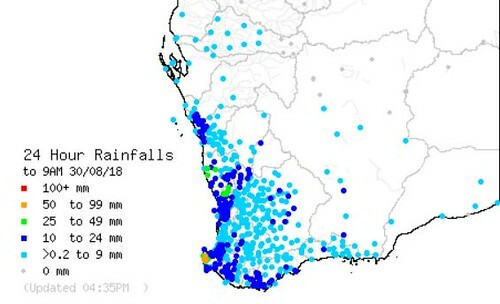 Some decent falls yesterday mainly heavier along the south coast . Another day another front approaching from the south west and another warning from BOM. for the period until midnight WST Thursday 9 August 2018. No boating it looks and if you want fish ...head to your fish and chip shop cause definitely no going out today or tomorrow with winds going strong onshore for a couple of days . 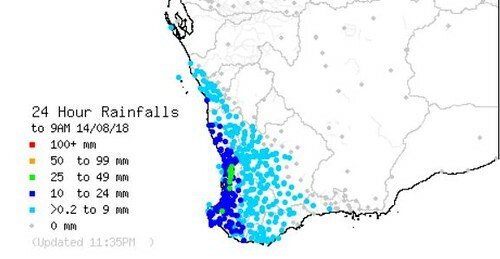 Good widespread rainfall from this latest front last night and more to come today me thinks. Lots of other areas well below 5 deg too. Turning out to be a very good wheat season this year with more widespread rain yesterday. They are predicting a bumper crop in W.A while our poor farmers in NSW have had drought conditions. ... A convoy of trucks is on its way from WA to regions in the East affected by drought or drought-like conditions, transporting supplies [hay by the looks]...good on them ! Yes Seira good to see that sort of response happening here and all around OZ to help our farmers in a time of hardship. I know WA farmers had their own memories of drought and are greatly sympathetic to the plight of farmers on the east coast. Very cold this morning in the south . Norsemen had a freezing -3.7deg , Collie -1.8 and Bridgetown -1.7. I'd likely say empathise to a degree. 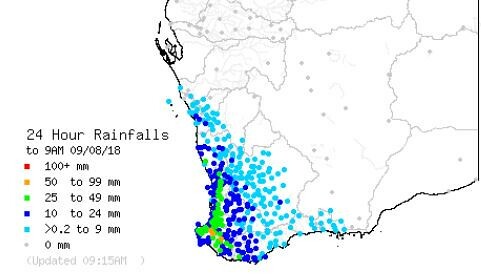 Some more rain along the south west , south coastal and adjacent areas with the passing of a low and associated front, not huge amounts but good follow up rain nonetheless. Current low and fronts bringing lots of rain to the south and adjacent areas as it works it way through from the south. 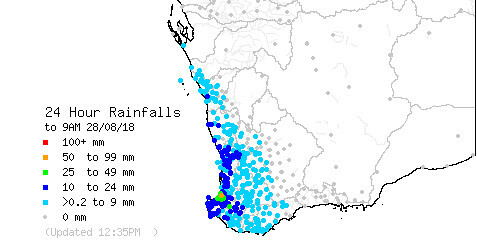 Low situated in the south of the state is bringing very good rainfall throughout most of the southern half of the state. 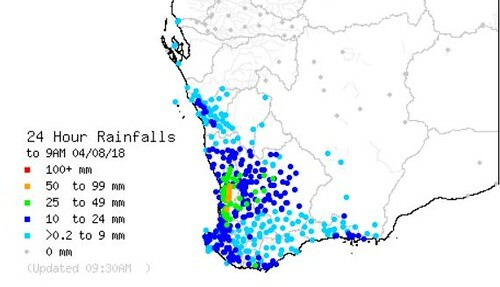 This low produced very good widespread falls. Had some very heavy showers on the road from Condingup to Esperance on Wed Aug 22, almost Darwinesque in the wet season in nature (minus the heat). Also one clap of thunder as well. Lots of interesting cloud structures and a few rainbows were seen from Norseman to Caiguna that day. Generated in 0.069 seconds in which 0.055 seconds were spent on a total of 14 queries. Zlib compression disabled.